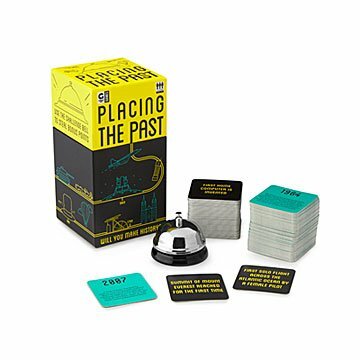 Compete with friends to place events on the correct timeline in this history trivia card game. What came first, the invention of bifocals or the first hot air balloon flight? Savvy history buffs know it was the balloon. ("Manned" by a sheep.) This game lets you compete against fellow amateur historians to place historical events in order. As you build timelines and learn fun facts, (Ben Franklin's to thank for those bifocals), players can challenge each other's placement to steal points. Some hands might seem easy—of course the Mayflower sailed before the mobile phone was invented—but keep adding cards to your timeline and it starts to get tough. Was the first skyscraper built before the Sydney opera house? When did Darwin reach the Galapagos again? In the end, the player who combines knowledge, a quick hand on the challenge bell, and a bit of luck will go down in history as the victor. Made in China. Fun game that gets the conversation going. We didn't read the rules, just dealt out 5 cards each. We sorted our cards out, then shared them and got comments from other players, and checked the dates on the back. We all learned a lot and it led to a lot of great discussion about history.